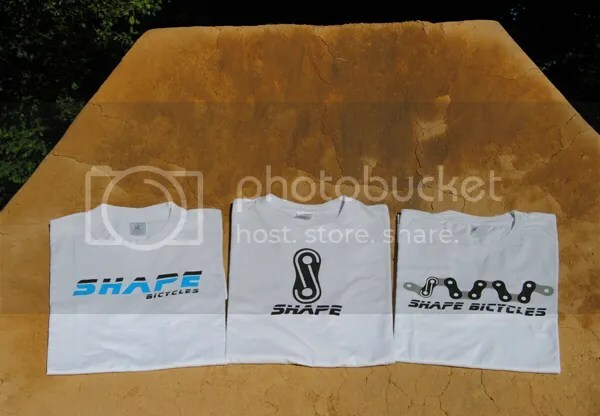 Shape is a new brand coming out of France, right? When did you officially decide to start your own brand? What were some of your reasons for doing Shape? Yes, Shape bicycles comes from France, everything is made here in Brittany – North West of France or sort of Western Europe! Everything started during winter 2010 – 2011, with the first batch of prototypes being launched in February – March 2011. Why I decided to do Shape bicycles, in fact it was really a dream for me to be able to link my knowledge in mechanics and my passion for BMX; so I linked my two passions as I felt the needs to ride bikes made with my own parts! To be honest, I was disappointed to see some companies create their range by only choosing their products on catalog … As I am into development and manufacturing due to my real job as a R&D engineer, I really want to create a French BMX company with a real link to production. So, the main idea behind Shape Bicycles is to design and manufacture some products in France; that gives a specific value to the products. It is always a big challenge not to make parts in the Far East but in the Western Europe instead! Plus, the French hexagon is full of companies specialized in machining, which allows me to follow the entire development process as well as the manufacturing of these parts closely. My second expectation behind Shape Bicycles is to draw products to a simple straightforward design, combining current inspiration with traditional values. Therefore Shape bicycles products are the fruits of two respective times with different trends and cultures, the nineties and the beginning of this new century. This cultural mix has given birth to a range of products which are, at the same time, simple in shape, but innovative in design! Last but not least, I believe in a comeback of simply designed products, without too many holes found in the parts. In fact, BMX is a dangerous sport, so why increase the risk with less resistant parts, plus some holes and other designs only save few grams, while generating more stress! What made you want to choose Shape for the name? First of all, I wanted to get an English sounding word, as easy to pronounce in English as in French; which means something linked to my vision of riding. After listing more than 150 ideas for names (it’s true), which was such a massive brainstorming project, I choose “Shape”, in fact everything has a shape, like “shape of the jump”! I decided to add “Bicycles” to feel free to design parts for different kind of bikes, not being restricted to BMX bikes if I either feel the need or not in the future. Where are you currently based out of these days? I’d imagine it’s still a pretty small operation, right? It’s a full process based in Brittany, from development to manufacturing products and so on. Almost everything is made at home by myself, development, marketing, labeling… The sprockets are made ten minutes from my house and the stems are made an hour and a half from where I live! As a result, I have the whole process in my hands. That is a real need for me in order to make sure nothing is wrong and save time. Running a business is a real hard thing to do without a little help. Other than yourself, who is involved with Shape? At the beginning there were two of us that started Shape bicycles. As the adventure went on, my mate wanted to stop his involvement for different personal reasons… Currently I lead the brand by myself, which could be easier and more difficult in the same way. On the other hand, my closest friends as well as my family give me some feedback about everything, from logos to parts; so I can’t say I’m really alone! Prior to starting Shape, you have done some product design work for a few other brands. Care to share who you have worked for over the years? 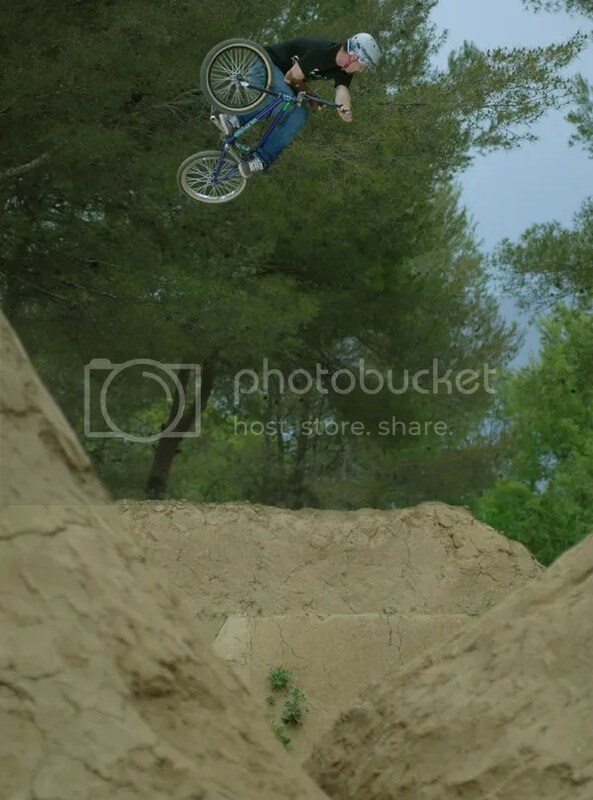 Yes, I have already had some experiences in BMX. 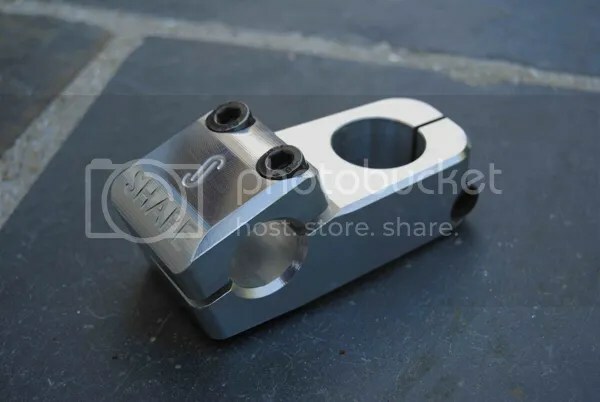 I developed some parts for Mark @ Deluxe (stem, seat clamp, bar ends…), as well as Ronnie @ Total BMX. My task is to do CAD work for them, starting from scratch with their first ideas until the prototype stages and final production. I like being in charge of this sort of production process to be honest! So, along with my passion for mechanics, these first experiences were another reason to take a chance and create my own brand; without leaving Mark and Ronnie alone though (thanks dudes). You went to college and recently graduated with an engineering degree. How important do you feel college is in an industry like this? It seems like you were able to do the job prior to finishing college. Yes, I’ve just passed my engineering degree a couple of weeks ago. In fact I was already able to lead some projects prior the end of my degree. Before college, I got some diplomas in machining and stuff like that (French equivalent of the A level in UK), after that I prepared my degree in apprentice ship (one week at school and one week in a company who develops and manufactures orthopedic prosthesis). So I really had already my hands in the industry and grease before being graduated! In general terms, I think college is important to be able to manage a whole project like Shape bicycles. Plus college gave me knowledge in CAD, mechanics and so on… In fact, BMX parts are based on mechanics like any other parts (ex: automotive, aerospace…) and need some knowledge to speak with suppliers and make sure everything is right. What’s a typical day like for you? Do you focus completely on Shape or do you have other projects you are working on as well? As I’ve just passed my degree, I’ve started a real job in a company who develops and manufactures automatic packaging process for food industry. So my typical routine is work from 8 a.m. to 5:30 p.m., after that Shape bicycles becomes my main focus! I manage my job and Shape bicycles in parallel and mix them sometimes. 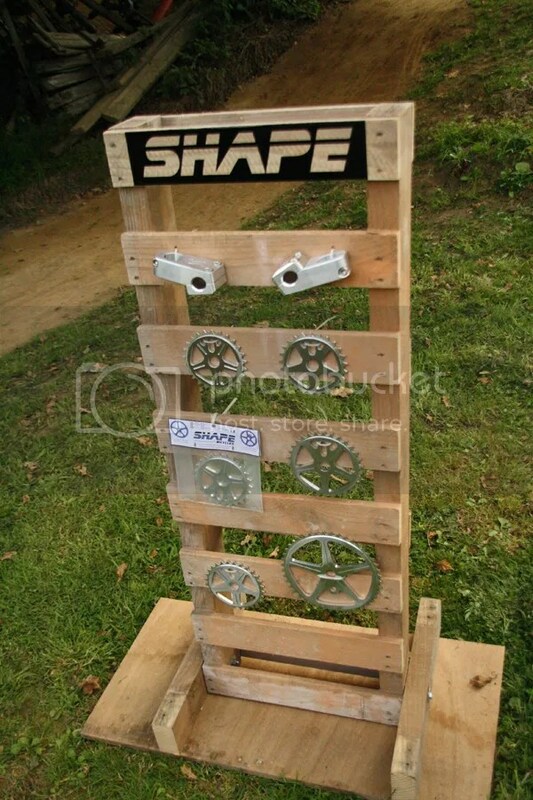 I can almost say that I had too much spare time and I needed to have a project like Shape bicycles to be busy!!!! I think that I can say my trails are another big project, as some of you know, it is another permanent job to maintain trails, but I like it so much! At last, my daily routine is composed of my job as R&D engineer, Shape bicycles project, trails and my girlfriend; I try to plan them as well as I can in 24 hours! Shape is rider owned. Sylvain getting it done. Since the brand is still real new, I’d imagine you have some solid goals and plans for the brand. Can you share with us where you want to take things as time progresses? First of all, I want Shape bicycles to be well known and receive a good welcoming from customers, suppliers, shops…etc. After making parts and soft goods real, I currently promote the brand as much as I can, and put a lot of efforts to spread the word about the brand, throughout magazines, Internet… Recently, I had an interview in the French Soul BMX magazine (issue #71). One of my wishes is to make the Shape bicycles website an interactive interface for everyone, a sort of good address for daily visits. I put as much information as possible up and try to keep it up to date all time (thanks to my webmaster – Aurélien). Your product line is focused on a stem and sprocket right now, right? Can you explain a little bit about what makes your products special? As I said, Shape bicycles production started at the beginning of 2011, the current range is composed of two parts. The part that I’m the most proud of is the stem; it is a top load stem inspired by the old and famous stems; with pure design and simple lines. Our stem has a double personality, which can be set up in both ways (normal – top load or reverse), this is why bolt are in this way (two up and two below). At last, the Shape bicycles stem isn’t super light but it’s what I imagine a stem should be. 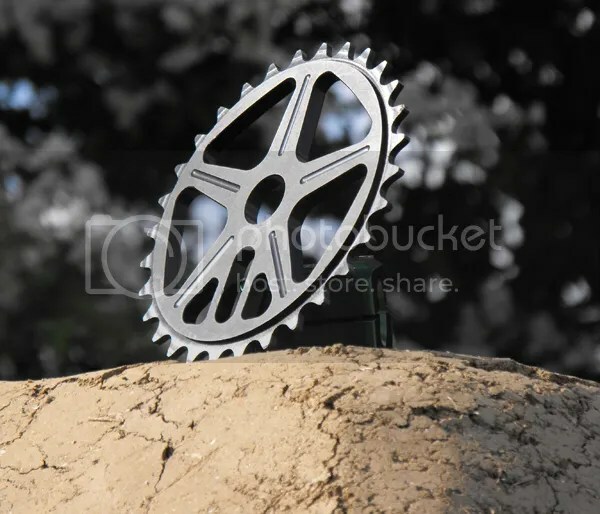 Then the sprocket, it is inspired by a famous old school wheel design. In a way it pays homage to the classic 5 branch design in the same time it enables every rider to remember what wheels were at the beginning of the BMX. I also paid attention to well positioning the bolt hole, which takes place between branches (not on a branch), in order to let the whole design be apparent when the sprocket is set up on a bike. In general aspects, Shape bicycles products are aimed at every rider even if the brand itself has some trail roots. Do you have any plans on expanding as time goes on? Frames? Forks? Bars? Etc. Not really as of right now, I think there are already some brands on the market who are able to make proper frame, fork and so on. I’m into machining to welding, but I’d be very interested in making my own frame for myself! Maybe one day Shape bicycles would make frames and others… Time will tell! What about soft goods? Any plans of adding more to the line? It looks like you have a t-shirt out right now as well. I saw a few web videos from the trails trip you and your team dudes took the other day. Do you have any more trips or anything you are getting excited for planned? The trail trip in UK this summer was our first sort of trip. It wasn’t with the whole team, just me and one of my friends – Stéphane who makes the edits (thanks to him). It was a first experience ever under the Shape bicycles flag. To be honest I’m in love with UK and it was obviously the first destination to go! The reason for that is I was staying in UK for 3 months about 2 years ago; I carried out a training period for my engineering school. So I worked in a company located North of London and visited a lot of trails and so on… This is why UK was my choice destination for this first trip; in order to see my friends again overseas. Who’s all on the team at the moment? Any plans on adding more guys in the future? 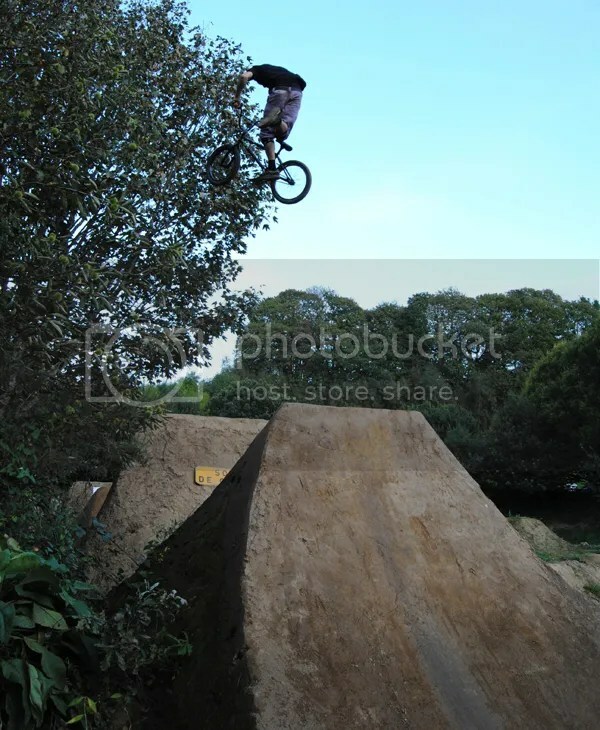 Two guys are on board to represent Shape bicycles; the first, Bruno Abiven who lives in Brittany is a true trails rider! The other, Bérenger Cordier, is from the Peynier trail (he is one of the main organizers behind the Vans Kill the line contest), who often travels throughout Europe. It was clear for me to put together a team, and my wish is to be as close as possible to them, to create a strong relationships. Currently, I’m working along with both of them to develop signature parts. Bérenger is working on a gyro plate, which matches the stem, and Bruno is working on plastic bar ends, which have the same design as the sprocket. 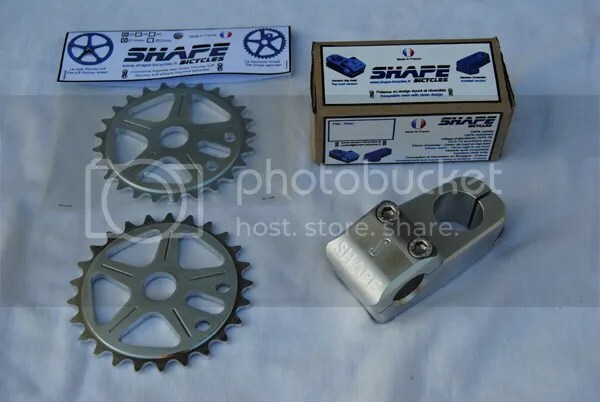 I also have a lot of friends who really support Shape bicycles, even if they aren’t real “team riders”, they believed in my project from day one and either run a sprocket or a stem! Obviously I’m thinking about adding a foreign rider to represent Shape bicycles overseas, maybe in the UK or USA. I’ll see. Let’s say somebody has an issue with one of your stems. What kind of warranty does Shape offer? Who should shops or distributors talk to, to get Shape in their stores and warehouses? What about general questions? I have already started talking to BMX shops to sell Shape bicycles in it. In fact, one shop has recently become an “authorized dealer” in Brittany – “Torch bike shop”. Now, my goal is to expand the Shape shop network and get more dealers and a distributor in France as well as overseas? Please contact contact@shape-bicycles.fr for inquires. I want to finish the current projects with the team riders as well as developing a lot of other parts. I mainly want to say thank you to you for the interview, Shape bicycles team riders, my friends for being so supportive, my suppliers, customers and obviously my family… Thanks everyone! To buy the stem, for the moment, you must directly contact Sylvain with this e-mail: contact@shape-bicycles.fr.